Investment is most successful when it is most businesslike. An investment operation is one which, upon thorough analysis, promises safety of principal and a satisfactory return. Operations not meeting these requirements are speculative. Government's debauchery of money to further its aims is as old as time. But Ben Bernanke's central bank has turned more tricks than the Bunny Ranch, and the money supply has finally responded to his goosing. The price of this paper, once considered so toxic, has doubled since the end of the financial world was feared a couple years ago. When a local banker told me last week, "we're lending money again," I replied, "lending officers are paid to say their bank is lending, even when they can't get a deal approved." "No, we're really lending. In fact, our builder finance group is out looking for deals." These anecdotes should give Keynesians comfort that bankers did not develop long memories in the wake of the financial meltdown. So, are markets a puzzle or mystery? That's the question Vikram Mansharamani poses at the beginning of his excellent Boombustology: Spotting Financial Bubbles Before They Burst. Mr. Mansharamani teaches a seminar at Yale, entitled "Financial Booms and Busts," and his book is structured as a class on the subject should be. He uses a clear and systematic approach to a subject that is murky at best. The author draws from a variety of disciplines in his quest to understand booms and crashes, spending the first part of the book explaining the lenses that he uses to examine these events. He disposes of the efficient-market hypothesis in his microeconomic lens and instead opts for George Soros's theory of reflexivity. Thankfully, the Yale instructor is clearer in his writing than Mr. Soros. Instead of higher prices meaning lower demand and lower prices increasing demand thus leading to equilibrium and efficient markets, reflexivity takes into account human behavior. Markets shape participants' thinking, and participants' actions in markets shape market prices. Therefore, during booms, increasing asset prices lead to further increases. In busts, it's the reverse. Soros is unique in suggesting that observers actually change the reality that they are diligently trying to observe, and that this changed reality in turn affects their perception, creating a self-reinforcing cycle that compounds misperceptions. Ironically, the author looks to the Austrians for the greater part of his macroeconomic perspective (along with Hyman Minsky), leading with a quote from Mises and quickly recognizing fractional reserves and central banking as culprits in bubble creation. Mansharamani uses the work of Roger Garrison to great effect. Those who have seen the Mises Institute's business-cycle T-shirt will recognize the graphical representation of malinvestment through low interest rates pioneered by Garrison. Behavioral economics provides the theoretical underpinnings for the psychological analysis. Property rights, taxing policies, and the like form Mansharamani's political lens, and the likening of human behavior during booms and busts to fevers and insect swarms provides the biological framework. Academic economists will likely take the most issue with the author's use of psychological and biological insights to explain extraordinary market behavior. But anyone who has negotiated with their spouse over what to list their house for — or lived through an actual boom and bust — will appreciate the biases identified by behavioral economists and herd behavior. The Yale lecturer then points these lenses at five bubble-and-crash episodes, from Tulipmania to the recently busted housing boom. The Austrian view is used throughout, including this writer's work on the Dutch monetary environment during Tulipmania and Mark Thornton's skyscrapers and business-cycle research, which is mentioned multiple times: the 1920s boom, the Asian contagion, and in a chapter contemplating whether China is a bubble on the verge of collapse. The author's recounting of the Florida land boom that preceded the 1929 stock-market crash and Great Depression is especially good as Mansharamani cites the fresh and insightful perspective of Frederick Lewis Allen, whose book Only Yesterday was published in 1931. Prohibition funneled money into Florida like nowhere else because the Sunshine state was what William Johnson Frazer called "one of the country's leakiest spots on the country's dry border." Illegal booze was being sailed into Florida and the money was flooding into Florida banks. Regulations required that bankers do business in their home state, and Florida's bankers figured they couldn't get hurt in the dirt. As wild as the valuations became for property values and stock prices during the Japanese boom, that was nothing compared to the frenzy for golf-club memberships. Citing Christopher Wood's definitive work on that episode, the total market value of golf-club memberships peaked at $200 billion, despite Japan having only 1,700 golf courses. Loose money always gushes into Picassos and van Goghs during booms, and Mansharamani provides an interesting sidebar with a chart of Sotheby's common stock going back to mid-1988, just before the final run-up of the Japanese stock market. The stock price for the auction house peaked as the Nikkei was peaking. It ran to higher highs as the Internet bubble was cresting. Sotheby's ran to all-time highs with US house prices in 2006/7 and has run up again since the '08 crash with the China boom and the Federal Reserve's QE1 and 2, and currently is trading near the high of $58 a share set in October 2007. 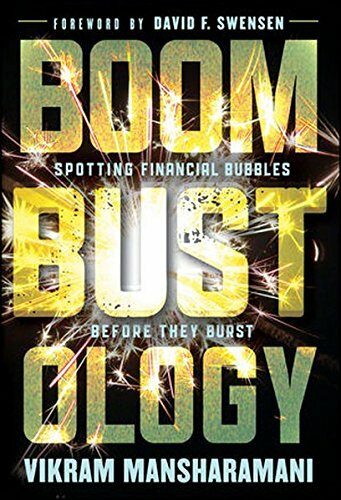 Anyone teaching a course on financial markets or speculative bubbles will want to use Boombustology. The book is laid out in perfect fashion to teach from, only lacking study questions. But will investors be able to use Mansharamani's for profit? In the book's introduction, Yale University's Chief Investment Officer David F. Swensen, writes that the author falls short of aiding investors in making money. Mansharamani gives us some whys and things to look for, but doesn't tell us when. "Early looks a lot like wrong," writes Swensen. A bubble wouldn't be a bubble if you could connect all the dots. Mr. Swensen should stick to crossword puzzles. These days, markets are for speculators only.